2009 Winsdown Royal Doulton- (Chestnut Colt by Winsdown Westinghouse)-(3 SBR points) 2009 Denver Queen City CO Futurity Weanling Grand Champion. 2009 Texas Futurity Reserve Grand Champion. 2009 Oklahoma Futuirty Amateur Reserve Champion. 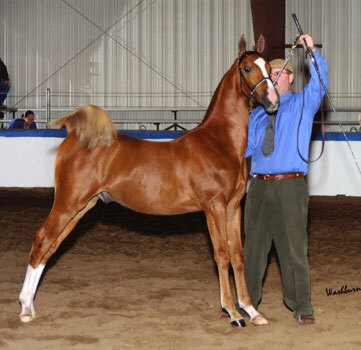 2010 Denver Queen City CO Futurity Yearling Grand Champion. 2010 Missouri State Fair MO Futurity Amateur Yearling Champion. WC Cat's Don't Dance (5 SBR points)- 2002 KSF WC 5 Gaited Show Pleasure 36 & Over. 2002 Lexington 5 Gaited Show Pleasure Grand Champion. 2002 American Royal 5 Gaited Show Pleasure 39 & Over Reserve Champion. 2003 Asheville Lions 5 Gaited Show Pleasure Reserve Champion. 2003 American Royal 5 Gaited Show Pleasure Adult 39 & Over Reserve Champion. 2008 KASPHA 5 Gaited Show Pleasure Adult Champion. 2008 American Road Pony 5 Gaited Show Pleasure Grand Champion. 2008 Indianapolis Charity 5 Gaited Show Pleasure Adult Grand Reserve Grand Champion. 2008 Lawrenceburg 5 Gaited Show Pleasure Champion. 2009 Prince Of Wales 5 Gaited Show Pleasure Champion. 2009 Janian Octorber II 5 Gaited Show Pleasure Champion. Eyes On The Prize- 2004 Dayton UPHA Park Pleasure Champion. Arrowhead's Blue Man- Octoberfest (MN) Park Pleasure Junior/Novice Park Pleasure Reserve Champion. This Blues For You- 2009 Rock Creek UPHA Park Pleasure Reserve Champion. 2009 Shelby County 3 Year Old Park Pleasure. 2009 State Fair Of Texas 3 Gaited Show Pleasure Adult Reserve Champion. 2009 St. Louis 3 Gaited Show Pleasure Jr. Ex. Champion. 2010 River Ridge Junior Park Pleasure Champion. 2010 Iowa Fall Classic Park Pleasure reserve Grand Champion and Park Pleasure Open Champion. 2010 Bonnie Blue Virgina Owned Show Pleasure Champion. 2011 Mid-America Mane Event 3 Gaited Show Pleasure Novice Reserve Champion. 2012 Illinois State Fair 3 Gaited Show Pleasure Jr. Ex. 14-17 Champion. WC CH Heart To Heart- 1972 Lexington 3 Gaited 3 Year Old 1973 Milwaukee Spring Amateur Grand Champion. 1974 KSF WC 3 Gaited Amateur Under 15.2. 1977 KSF WC 3 Gaited Amateur Under 15.2. 1978 Indiana State Fair 3 Gaited Amateur Grand Champion. 1978 River Ridge 3 Gaited Amateur Grand Champion. 1978 KSF WC 3 Gaited Amateur Under 15.2. Abba Zabba- 1989 Cares Junior Fine Harness Reserve Champion. 1990 Del Mar Charity Fair Fine Harness Limit Champion. 1996 Glen Valley Classic 3 Gaited Country Jr. Ex. Grand Champion. 1997 Mid-America Spring 3 Gaited Country Jr. Ex. Grand Champion. Georgene's Show Girl- 2001 Mid-America Signature 5 Gaited Junior Champion and 5 Gaited Novice Champion. 2002 Oshkosh 5 Gaited Open Reserve Champion. 2003 Carousel 5 Gaited Amateur Reserve Grand Champion. 2004 Carousel Park Grand Champion. 2005 Carousel 5 Gaited Amateur Reserve Grand Champion. 2007 Equistar Park Amateur Champion. 2007 Arizona Futurity Model Amateur Champion. Bluebonnet's Great Scott- 2007 Texas Futurity 2-Year Old In-Hand Champion. 2009 TASHA Winter 5 Gaited Junior Reserve Champion. 2009 Roanoke Valley Park Junior Reserve Champion. 2009 Shelby County Park Junior Reserve Champion. 2010 Jersey Classic 3 Gaited Show Pleasure Reserve Grand Champion and 3 Gaited Adult Show Pleasure Champion. 2010 Syracuse International 3 Gaited Country Pleasure Limit Champion. Spring Kick-Off Event Park Junior/Novice Champion. 2011 NY State Horse Breeder's Park Junior/Novice Grand Champion. 2012 NY State Horse Breeder's Park Junior/Novice Grand Champion. Bluebonnet's Royal Flush- 2010 TASHA Winter Classic 3 & Under Saddle Champion. 2010 SASHA Fine Harness Junior Champion. 2010 SASHA Fine Harness Junior/Novice Champion. 2010 Big D Fine Harness UPHA Champion. 2011 TASHA Winter Classic 5 Gaited Junior Reserve Champion. Excelsior's Fire Opal- 1991 Del Mar National Junior 3 Gaited Champion. CH Red Hot Momma- 2008 Big D Country Western Reserve Grand Champion. 2008 St. Louis Charity Shatner Working Finals Grand Champion and Country Western Junior Horse Champion. 2009 MHSA Country Western Reserve Grand Champion, Open Western Grand Champion and Open Western Amateur Champion. 2009 MHSA Kick-Off Open Western Grand Champion. 2009 Big D SB Shatner Champion. 2009 Boone County Fair Country Western Grand Champion. 2009 St. Louis SB Shatner Reserve Champion and Country Western Trail Reserve Champion. 2010 St. Louis NATIONAL CHAMPION S&B Working Finals and NATIONAL GRAND CHAMPION Country Western Pleasure Horse. 2010 MHSA Kick-Off Country Western Grand Champion. 2010 Big D Country Western Grand Champion. 2011 Boone County Fair (MO) Country Western Grand Champion. 2011 St. Louis NATIONAL CHAMPION S&B Working Finals and NATIONAL GRAND CHAMPION. 2012 Bridlespur MHSA Kick-Off Country Western Grand Champion and S&B Shatner Champion. 2012 Big D Country Western Working Champion. 2012 Germantown Country Western Grand Champion. 2012 Missouri State Fair Country Western Grand Champion. 2012 Country Western Wroking Champion. WC dam Peregrine- 1986 Cares 3 Year Old 3 Gaited Champion. 1987 Del Mar National 3 Gaited Junior Champion. 1987 Del Mar Charity Fair 3 Gaited Junior Champion. 1987 Santa Barbara 3 Gaited Junior Champion. 1992 Monterey Springfest 3 Gaited Country Grand Champion. 1992 3 Gaited Country Grand Champion. 1994 California Futurity 3 Gaited Country Grand Champion. 1996 California Fall Classic 3 Gaited Country Reserve Grand Champion, 3 Gaited Country Champion and Broodmare and Foal Champion. WC dam WC CH Eleanor Rigby- 1993 California Spring Classic 5 Gaited Grand Champion. 1993 Monterey Springfest 5 Gaited Grand Champion. 1993 Santa Barbara 5 Gaited Grand Champion. 1994 ASHAV Fine Harness Amateur Grand Champion. 1994 American Royal Fine Harness Amateur Grand Champion. 1995 Rock Creek Fine Harness Amateur Grand Champion. 1995 Lexington Fine Harness Amateur Grand Champion. 1995 KSF WC Fine Harness Amateur Gentlemen. 1996 KSF WC Fine Harness Amateur Championship and Amateur Gentlemen. 1996 ASHAV Fine Harness Amateur Grand Champion. 1997 KSF WC Fine Harness Amateur Championship. 1997 Kentucky Fall Classic Fine Harness Amateur Grand Champion. WC sire WC CH Call Me Ringo- 2001 Rock Creek Fine Harness Champion. 2001 Lexington Fine Harness Amateur Champion. 2002 Rock Creek Fine Harness Grand Champion. 2002 Lexington Fine Harness Grand Champion. 2003 Lexington Fine Harness Grand Champion. 2004 Asheville Fine Harness Grand Champion. 2007 Rock Creek Fine Harness Grand Champion. 2007 Lexington Fine Harness Grand Champion. 2010 Rock Creek Fine Harness Amateur Reserve Champion. A Revolution- 2004 Gasparilla Charity Park Denver Junior Champion. 2008 Raleigh Invitational Park Pleasure Grand Champion. 2009 Charlotte Charity English Pleasure Reserve Grand Champion. 2010 Asheville Spring Reserve Grand Champion 3 Gaited Show Pleasure Jr. Ex. and 3 Gaited Show Pleasure Jr. Ex. Champion. A Ticket To Ride- 2004 Blue Ridge Classic Fine Harness Junior Champion. 2004 Challenge Of Champions Fine Harness Grand Champion. 2006 Challenge of Champions Pleasure Driving Champion. 2012 Deerfield Fair Show Pleasure Driving Grand Champion. Bungalow Bill- 2006 All American 3 Gaited Limit Champion. 2008 Spring Jubilee 3 Gaited Novice Champion. 2009 Kentucky Fall Classic 3 Gaited Limit Reserve Champion. 2010 Harrodsburg 3 Gaited Amateur Reserve Champion. 2010 Kentucky Spring Premier 3 Gaited Amateur Reserve Champion. 2011 Lawrenceburg 3 Gaited Show Pleasure Jr. Ex. Grand Champion. 2011 Mercer County Fair 3 Gaited Show Pleasure Jr. Ex. Grand Champion. 2012 Shelbyville Country Pleasure Driving Grand Champion. 2012 All American Horse Classic Country Pleasure Driving Grand Champion. Maybe I'm Amazed- 2004 KSF Ribbon Winner. 2004 Southeastern Fine Harness Grand Champion. 2005 Roanoke Fine Harness Junior Grand Champion. Father McKenzie- 2007 Greater Springfield Fine Harness Junior Champion. 2007 St. Louis UPHA Fine Harness Champion. 2008 Oklahoma Centennial Park Pleasure Grand Champion. 2008 Boone County Fine Harness Junior Champion. 2008 KSF RIbbon Winner. 2009 ASAC Show Pleasure Reserve Grand Champion and Pleasure Driving Champion. 2009 Asheville Lions Fine Harness Ladies Reserve Champion. 2009 Asheville Invitational Fine Harness Open Champion. 2009 NC State Championship Fine Harness Amateur Grand Champion. 2010 Raleigh Spring Fine Harness Reserve Grand Champion. 2010 Blowing Rock Amateur Fine Harness Reserve Champion. 2011 Blowing Rock Fine Harness Grand Champion. 2011 NC Amateur Fine Harness Grand Champion. 2012 Raleigh Spring Show Pleasure Driving Reserve Grand Champion. 2012 Roanoke Valley Show Pleasure Show Pleasure Driving Grand Champion. Ask Me Why- 2010 Kentucky Spring Premier 3 Year Old Park Champion. 2011 River Ridge Park Junior Reserve Champion. 2011 Lawrenceburg Show Pleasure Driving Champion. 2011 Springfield Charity (OH) Park Reserve Grand Champion. 2012 Boone County Fair (KY) 3 Gaited Reserve Grand Champion and 3 Gaited Open Champion. 2012 Kentucky Spring Premier 3 Gaited Junior Champion. WC dam Dear Heart BKO- 1992 Santa Barbara 3 Gaited Show Pleasure Novice Rider Reserve Champion. Chief Angel- 2009 Olde Milton Park Harness Champion. 2010 Old Milton November 5 Gaited Reserve Champion. 2011 Old Milton February 5 Gaited Amateur/Jr. Ex. 2012 Dixie Cup Show Pleasure Driving Grand Champion. WC and WC sire Exalted Effect- 1997 Kentucky Fall Classic UPHA Fine Harness Champion. 1997 American Royal UPHA Fine Harness Finals Grand Champion. 1997 Winterfest Fine Harness Grand Champion. 1998 Lexington Junior Fine Harness Champion. 1998 KSF WC Fine Harness Junior Championship. 1998 ASHAV Fine Harness Grand Champion. WC dam Heart's Miracle Miss- 1995 UPHA Champter V Junior 3 Gaited Champion. 1995 Midwest Charity Junior 3 Gaited Champion. 1996 American Royal Mo/Kan 3 Gaited Grand Champion. 1999 UPHA Chapter V 5 Gaited Reserve Grand Champion and 5 Gaited Mare Champion. WC Marie Claire- 2002 St. Louis 5 Gaited 2 Year Old Champion. 2003 UPHA Chapter V UPHA 5 Gaited Reserve Champion. 2006 All American Horse Classic Equitation Grand Champion. 2007 All American Horse Classic Equitation Grand Champion. 2008 Kentucky Fall Classic Equitation Grand Champion. 2009 Rever Ridge UPHA Challenge Cup 14-17 Champion. 2009 Syracuse Int. SS Equitation Grand Champion. WC Enchanting Memories- 2004 Children's Benefit- UPHA 5 Gaited Champion. 2005 American Royal Junior 5 Gaited Champion. River Ridge 5 Gaited Amateur Mare Champion. 2007 Syracuse Int. 5 Gaited Amateur Grand Champion. 2007 Penn National 5 Gaited Amateur Grand Champion. 2008 Children's Benefit 5 Gaited Amateur Grand Champion. 2009 River Ridge 5 Gaited Ladies Champion. 2009 Devon 5 Gaited Amateur Reserve Champion. 2009 Syracuse Int. 5 Gaited Amateur Grand Champion. 2009 Children's Benefit 5 Gaited Amateur Grand Champion. 2009 KSF WC 5 Gaited Amateur Gentleman. 2009 Eastern States 5 Gaited Amateur Reserve Grand Champion and 5 Gaited Amateur Champion. 2009 American Royal 5 Gaited Amateur Mare Reserve Champion. 2010 Devon 5 Gaited Amateur Grand Champion . 2010 Children's Benefit 5 Gaited Amateur Grand Champion. Memories' Jazz Queen- American Royal 2 Year Old 3 Gaited Reserve Champion. 2009 UPHA Chapter V UPHA 3 Gaited Reserve Champion. 2009 Mid-West Charity UPHA 3 Gaited Reserve Champion. 2009 St. Louis 3 Gaited 3 Year Old Reserve Champion. 2010 Springfield Charity 3 Gaited Junior Champion. 2010 St. Louis 3 Gaited Junior Champion. 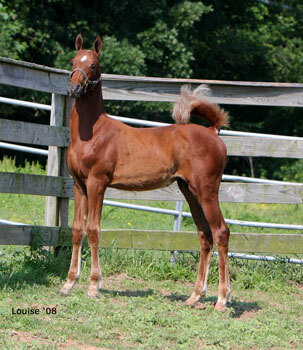 2011 Syracuse 3 Gaited Jr. Ex. Reserve Grand Champion. 2011 Ohio State Fair 3 Gaited Jr. Ex. Reserve Grand Champion. Great Daily March- 2002 Midwesst Charity 2 Year Old Fine Harness Reserve Champion. 2003 Midwest Charity 3 Year Old Fine Harness Champion. Hoops (AKA U Da Man)- 2008 Madison Classic Fine Harness Junior/Novice Reserve Champion. 2010 Oshkosh Fine Harness Grand Champion. 2010 ASAW Fine Harness Champion. 2011 Madison Classic Fine Harness Grand Champion. 2011 Wisconsin Futurity Fine Harness Junior/Novice Reserve Champion. A March Day- 2006 Ohio State Fair 3 Year Old Fine Harness Champion. 2007 Ohio State Fair Fine Harness Reserve Grand Champion and Fine Harness Junior Champion. 2009 Summer Challenge Of Champions Park Pleasure Grand Champion. An Earth Angel- Kentucky Fall Classic 2 Year Old Fine Harness Champion. 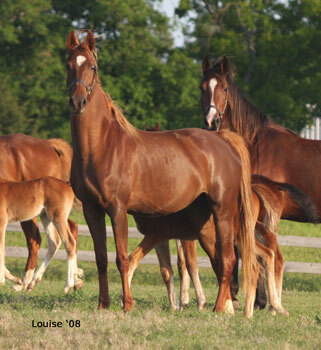 A Royal Gift- 2009 Kentucky Spring Premier UPHA Fine Harness Champion. 2009 Rock Creek Park Pleasure Driving Champion. 2010 Blue Ridge Classic Park Pleasure Driving Grand Champion. 2010 Kentucky Spring Premier Park Pleasure Driving Grand Champion. Buck's Big Time- 2003 Carousel Charity 3 Gaited Park Junior/Novice Champion.